Motivation for weight loss is very important when we need to succeed. In fact anything we want to change in our lives, for the better, requires thought and dedication. But does another day go by when we promise to make changes and fall short? Are you stuck in the same old routine? Any type of change in our daily lives can seem disruptive and challenging. It is hard to change routines such as eating habits, especially ones we have been doing for a long time, even when we know some choices are not in our best interest. We each have our own reasons why we need to get motivated. It doesn’t have to be weight loss, it could also be quitting smoking or making the effort to get physically fit. In fact studies have shown that most people will usually make positive changes in their lives to avoid pain, more so than to gain pleasure. So pain is definitely a much stronger motivator. Which leads us to the all important question. 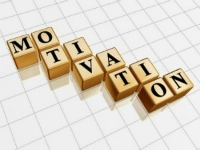 How can we get motivation for weight loss success? Here are several steps that have proven to be effective, no matter what your goals may be. When it comes to motivation for weight loss success the first step is to know exactly what you want to achieve before taking action. Setting a goal is of great importance because it is a way of telling ourselves that we are not where we want to be in our lives. We want to make things better. Also setting any goal creates a positive pressure which helps us to move forward, wanting to succeed. Now that you know your objective, take some time and write it out in detail. Now moving onward, you need to ask yourself a few more questions. We have provided a worksheet to get you started on the next step. When answering the questions on the worksheet take your time and be as honest as you can with yourself. Think of this as your own personal journal. Write down what you really feel. 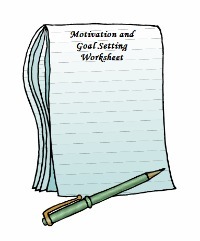 Click on picture to open the Goal Setting Work Sheet to get you started. It helps you build a written foundation of what you want to achieve and why you need to accomplish this goal and how it will change your life. So you have established your goal in detail and have the work sheet to start. What else should you have that would give you more ammunition to help you on your way to success? Motivational tips, that's what. Find and read as many as you can to help inspire you along the way. Choose the ones you like and keep them handy. They can be a best friend on those challenging days. Here are some motivation techniques that will definitely make your weight loss journey much more pleasurable. Use these tips to get excited about changing your life for the better. Every bit of help can be inspiring when we are working to achieve a goal to improve personal growth. With every small step you are taking charge creating your destiny.